To understand how potatoes behave in the stock pot, Katherine puts a favorite soup under the microscope – literally. Potato leek soup is the perfect soup. It is heaven pulled from the ground in all its humble grassy beauty. Potato leek soup is good-looking, simple, and flexible. It can be made vegan and provides nutrients and fiber with few calories. It is cheap, scales up for a crowd, and freezes well. Plus you have to love a soup with more names than ingredients. As a comforting wintertime staple, we call it what it is – potato leek soup. In tiny cups, sprinkled with chopped parsley and freshly ground black pepper, it becomes potage Parmentier, a rich tasting but delicate entrée to an elegant dinner party * . Chilled, with fresh cream, it is Vichyssoise, the cool, light partner of a good baguette and a glass of Pouilly-Fumé on the patio in summer. And my mother-in-law has demonstrated many times that when the holidays overwhelm your fridge, you can store a huge pot of potato leek soup on the porch overnight – as long as you put a brick on the lid to keep the raccoons out. This amazing soup is the just about easiest thing in the world to make. Julia Child’s version is probably the most widely used, and the one I like: simmer equal parts cubed potato and sliced leek in water until they are tender. Add salt to taste and puree. A bit of cream is optional. A dusting of chopped parsley and freshly ground black pepper is divine. I like to err on the side of more potatoes than leeks, but the soup is robust to variations in proportion. But is it really so easy? If you trust the internet more than you trust your favorite dog-eared chocolate-spattered cookbook with the broken spine and decades of marginalia (silly you), you may worry that without the right kind of potato and extremely careful handling, your soup will end up gluey. Is any wallpaper not pre-pasted these days? Doubtful, but everyone seems to describe gluey potato soup or mashed potatoes as “wallpaper paste.” I will say right up front that gluey soup has never happened to me, but given all the stress over this utterly simple soup, it seemed worth investigating. The many varieties of potato can differ a lot in flavor and texture, so which should we use in our soup? Julia Child uncharacteristically abandons us here in Mastering the Art of French Cooking, although in a later book (The Way to Cook), she does suggest using ordinary scaly brown baking potatoes. Mark Bittman explicitly says that “any kind” will do, whereas Alton Brown calls for Yukon gold, or a similar round and moist variety. 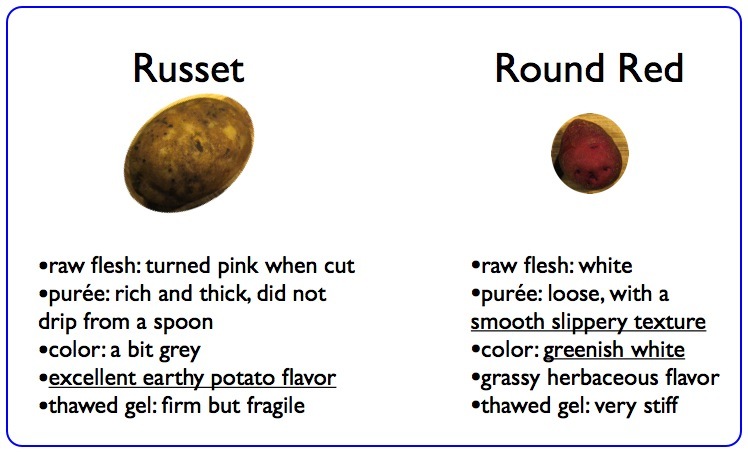 America’s Test Kitchen calls for russet baking potatoes but does not explain why. Potato varieties vary in both the amount and the combination of starches they contain, which has a big effect on their texture. Ordinary baking potatoes, such as the ubiquispud Russet Burbank, contain a lot of linear starch molecules that are hard to break apart. This makes them fluffy and dry and good for baking and making French fries. Fingerlings, red potatoes, and other “waxy” varieties contain less starch overall and a higher proportion is the branched sticky form. They absorb less water and stay firm when cooked, making them good roasted and in potato salad. Yukon golds are sometimes called all-purpose potatoes because they perform fairly well under both conditions. Starch is the main molecule plants use for storing energy within or between growing seasons. Starch is found throughout a plant body, even in green leaves, but it is most highly concentrated in seeds and specialized storage organs like potato tubers. Plants build starch molecules by stringing together the smaller glucose (sugar) molecules they make through photosynthesis and packing them tightly and efficiently into granules. When a plant needs sugar to fuel metabolism, it can just break down some starch and transport the sugars to the active cells. For example, when a barley seed germinates, enzymes digest the starch into glucose and maltose to be used by the growing seedling or to be toasted and brewed into beer. Starch granules, stained with iodine and viewed at 100X magnification. Cell walls are hard to see here. Starch molecules are packed into starch granules, which look a bit like freshwater pearls, layered and slightly irregular. 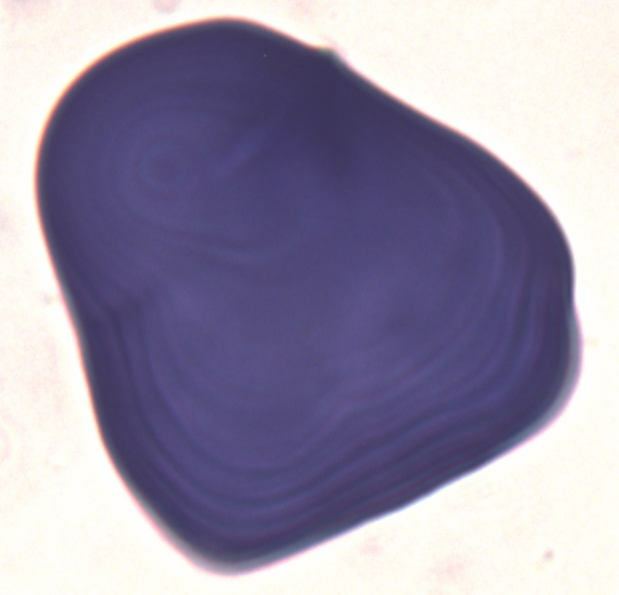 Staining the granules with iodine turns them inky blue and makes the alternating layers of amylose and amylopectin more visible. In living plants, the granules are surrounded by membranes (forming amyloplasts) and float like jelly beans inside large thin-walled storage cells. 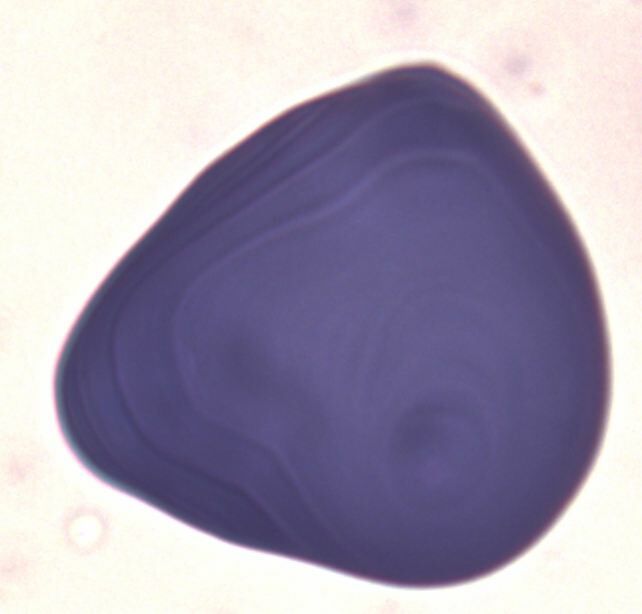 When I stained raw starch grains from amylose-rich baking potatoes and amylose-poor fingerlings, I could not tell any difference between them, even at 400X magnification. Because I’d never made gluey soup, I was excited to try. Internet lore suggests that potato leek soup texture depends less on the potato variety than on the violence with which you handle your soup after it is cooked. Rough handling with a blender or food processor is said to damage the starch granules and let too much starch leak out into the liquid to gum things up. Authors suggest using a nice gentle potato ricer or a hand-cranked food mill, as one does for mashed potatoes and finicky gnocchi. But I was interested comparing potato varieties, not handling technique. I thought that russets would make the thickest soup because of their high total starch content and their relatively greater proportion of amylose. As Hal McGee explains in his book On Food and Cooking, long amylose molecules are more effective thickeners than branchy amylopectins. But being thick is not the same as being gluey, and whether russet-based soup was also more vulnerable to becoming wallpaper paste was an open question. Russets and waxy potatoes may differ slightly in starch ratios, but they can also vary dramatically in flavor. What’s the point of worrying over texture if your lovely soup doesn’t taste right? At many farmers markets, there are dozens of oddly shaped and colored waxy potato varieties whose complex flavors really sing as part of a roasted vegetable medley. By contrast, ordinary scruffy brown bakers can be hard to find. A farmer who does sell russets told me that nobody buys them, so only a few farmers bring them to our local market. Apparently people find them boring. Would snooty varieties make better tasting soup? To find out, I bought several types of potato and treated them as violently as possible. I got Tater-tino on those spuds. The idea was to compare potatoes at the extreme, so I pushed them as far as I could towards being gluey. Then to see whether the starch granules did break down under this treatment, I put the purée under the microscope. The (loosely defined) “experiment” tested three types of potato: russet, a waxy round red kind, and a yellow-fleshed variety I thought would be intermediate. To estimate relative total starch, I replicated the 11%-salt-water-floating technique used by America’s Test Kitchen. This was fun, but it didn’t turn out as planned. The allegedly dense russet floated, bobbing alongside the waxy red potato, while the intermediate yellow variety sank. I decided to cook all three but focus my comparison on the two floaters. For each variety, I grated 3 oz of potato flesh into 9 oz of water (by weight). The russet immediately started to oxidize and turn pink. I brought the mixtures to a serious boil and held them there for 30 minutes, stirring until the potatoes were very well cooked. Then I put each batch separately into a mini food processor and liquified the living daylights out of it. In theory, here’s what was happening inside the potato bits as they were boiled and then processed. When the water temperature reached about 135 – 150 ºF (55 – 65 ºC), the starch granules inside the cells started to gel. The hot water worked its way into the granules, disrupting the tight packing, and turning the small grains into big bags of water-logged starch networks. With continued heating, the granules started to leak starch molecules into the water where they could bind one another into a loose mesh, trapping water and any remaining granules. As it cooled, the mesh became stronger because there was less disruptive heat energy to keep the molecules from binding. 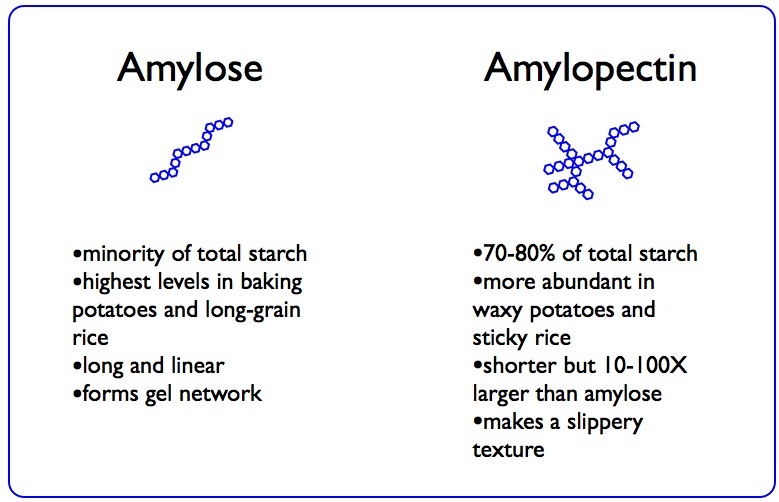 Recall that because of their shape, amylose molecules contribute more to the thickening than amylopectin molecules do. Now for the violent part. Blending the potatoes into a very fine purée was supposed to break open the already swollen and leaky starch granules, allowing the rest of the starch to pour out into the water and take part in the gelling. If rough handling really leads to a gluey texture, then all those liberated starch molecules must be to blame. First, I failed utterly to produce a gluey purée. The russet did form a very thick mixture, but it was not at all gummy or sticky. It was rich feeling and just a tiny bit grainy. The color verged on a very pale grey. The waxy soups were much thinner and greener in color. They were very smooth and slippery, and even almost slimy in a pleasant way. The snooty potatoes were a little snotty. Second, even a long hot boil and sustained whipping did not damage all of the starch granules. 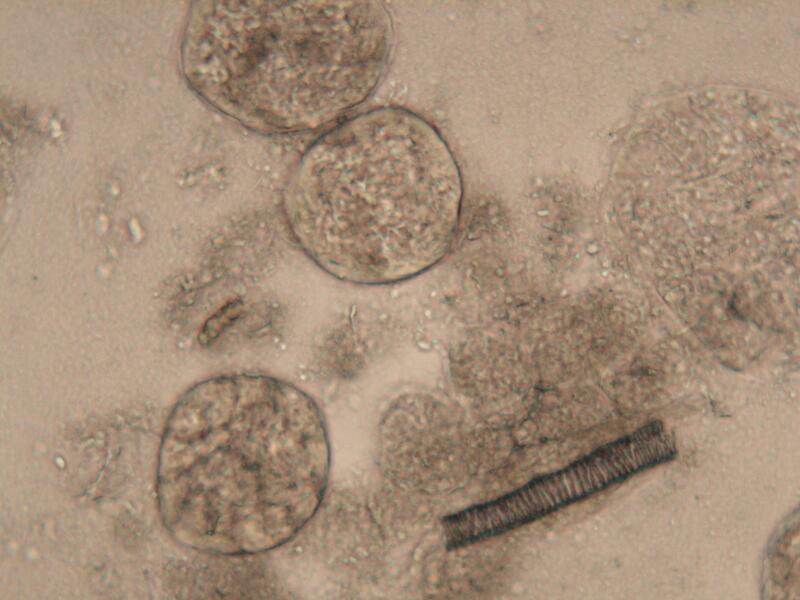 Both the russet and the round red potato still had plenty of starch granules visible under the microscope. My rough measurements suggest that the granules had swollen to nearly 40 times their original volume. The food processor blades did manage to destroy essentially all of the thin-walled storage cells that make up a tuber, but tough fragments of some of the reinforced water-carrying xylem vessels were still floating around. Waiter, there’s a vein in my soup (dark fragment in lower right)! 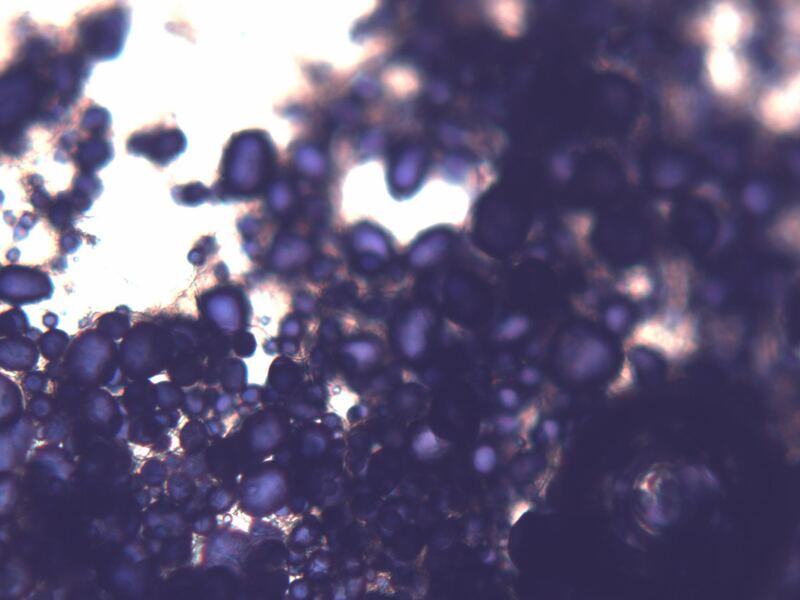 Unstained russet purée at 100X magnification, showing three starch granules. My most important observation was probably the dramatic difference in taste between the purées. Russets tasted like potatoes, earthy and rich, with a bit of umami. The waxy potatoes tasted grassy and herbaceous and even slightly sweet, with a bit of vanilla flavor. Salt didn’t help much. To be fair, I had stored all of the potatoes in the fridge for a couple of weeks, which does cause some starch (especially amylopectin) to be broken down into sugar. Nevertheless, it is hard to imagine ever getting a deep potato flavor from these waxy varieties. Pairing them with leeks would push the soup even farther in the green direction. These observations suggest that russet potatoes make the best tasting potato leek soup, but that adding a few waxy potatoes might enhance the smoothness and brighten the color. I’m also not going to abandon my immersion blender in favor of a ricer, but I respect anyone willing to go to the extra trouble just to be on the safe side. Earlier I claimed that potato leek soup freezes well, and it absolutely does. It’s the thawing that can be a problem. In the photo below, that chunk of soup in my hand is at room temperature all the way through. 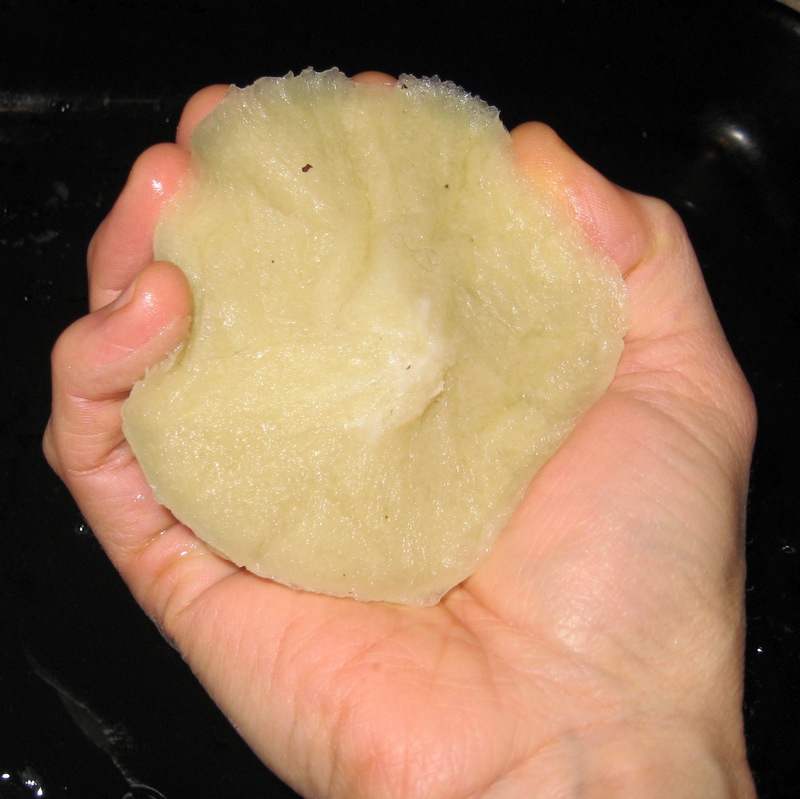 It has become a squeezable starch sponge due to a process called retrogradation. At low temperatures, starch molecules (especially amylose) line up and bond together in a crystalline structure, which remains even when the soup is thawed. The water is expelled from between the molecules, leaving just the spongey part behind. McGee notes that starch retrogradation also causes bread to go stale and long-grain rice to get hard in the refrigerator. Once the soup (or the bread or rice) is reheated, the starch dissolves again, and it regains its lovely texture. It turns out, then, that contrary to internet opinion, it is possible to redeem your potato leek soup if somehow it becomes gluey. Ladle some into a freezer bag, freeze it flat, thaw it, and pour off the water. Remove the congealed starch from the bag, sprinkle one side of it with baking soda, and use it to clean your sink. Voilà, the ultimate compostable sponge. This entry was posted in Uncategorized and tagged Katherine Preston, recipe, Solanaceae, vegetable. Bookmark the permalink. Interesting post, thank you. A soup resembling potato and leek is potage bonne femme. Yet another name. Thanks for that! Great, great post. Really fun read. I wonder, did you time the amount of processing for the three soups? Curious minds need to know how long it takes to count as going Tater-tino on a ubiquispud! As a more serious question, to what do you attribute the perceived problem of gluey soup, given how hard it was for you to reproduce the problem? Thank you for your excellent inquiry, Lanier. I confess that I have produced potato glue and am pained by the memory. I think it would be worth experimenting with potato-liquid ratios during the Tater-tino process as a further investigation of this spud glitch. I probably processed the soups for less than 60 seconds, but the volume was very small, and the soup was thoroughly processed. As for the glue problem, I agree with Jeanne that it’s probably the ratio of liquid to potato that matters. That’s a bit surprising to me, though, since I tend to use less liquid than Julia calls for.